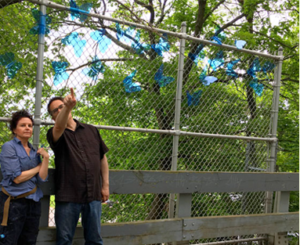 PATHWAYS was launched in 2017 to bring art into one of Arlington’s busiest public spaces: a section of the Minuteman Bikeway that traverses and connects the town’s Cultural District. 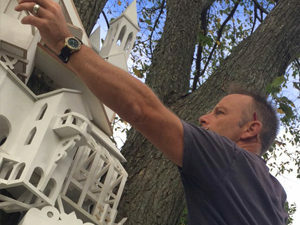 Installations are sited on a segment between Linwood Street and Swan Place, a half-mile stretch lined by tall canopy trees and featuring vistas of Spy Pond. Each year we commission artists to create site-specific work inspired by the natural and social qualities of the Minuteman, a well-travelled green space which welcomes thousands of people of all ages for biking, walking with family and friends, or solitary contemplation of nature. If you have an idea for a project on the Bikeway, please contact our curator and public art consultant, Cecily Miller. Colony and ExtraOrdinary Birds remain on view in 2019 with more to come later this year. imagined architectural elements perched on the trunk of a mature maple tree. 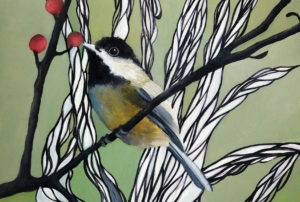 These collectible art postcards pay tribute to neighborhood birds with painted portraits by Resa Blatman and text by Ellen Reed. A combination of gorgeous images and pithy facts will get you started with birdwatching along the Bikeway and stewardship activities in your own back yard. Ripple, Current, and Flutter, remained on view into 2018. Two other works, Rhetoric of Opposites and City Fox, were installed in 2017 as temporary pieces and are no longer in view. 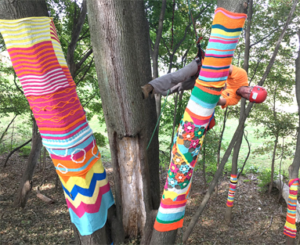 Ripple is a large-scale fiber piece transforming a group of trees with color, pattern and texture. 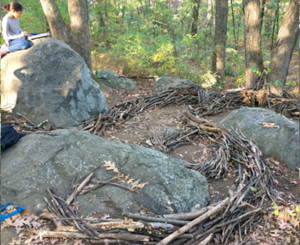 An environmental sculpture constructed of natural materials gathered on site arranged in a pattern that evokes a river flowing down a hillside towards Spy Pond. An installation of 65 translucent plexiglass butterflies calling attention to the amazing strength and resilience of these tiny creatures. 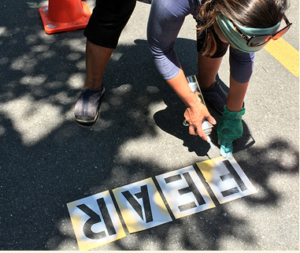 A work consisting of 25 pairs of words stenciled on the pavement of the bikeway, exploring the way language can be used to polarize opinion and divide people. 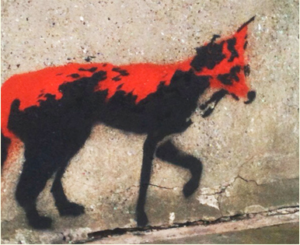 A stenciled fox and rabbit by British street artist who has catalogued urban wildlife surviving in the City of London. PATHWAYS is curated by APA’s Public Art Consultant Cecily Miller in collaboration with a committee of representatives from the Arlington Commission on Art and Culture: Adria Arch, Lorri Berenberg, Barbara Costa and Stephanie Marlin-Curiel. Charles Tracy, National Park Service and Ali Carter, Arlington Planning Department, serve as PATHWAYS advisors. For more information contact Cecily at cecily.apa@gmail.com.